 Amchoor, an ingredient of chaat masala. 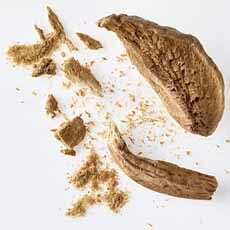 A fruity spice powder made from dried unripe green mangoes, it adds citrusy notes (photo courtesy La Boite NYC). 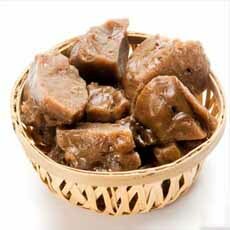 Asafoetida, the dried gum of the taproot of an herb, is ground into a powder (photo courtesy Jain Dry Fruits). 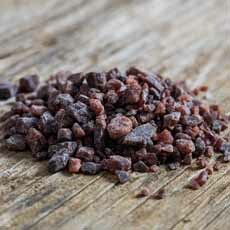 Black rock salt, another ingredient in chaat masala (photo courtesy Nutty Yogi). 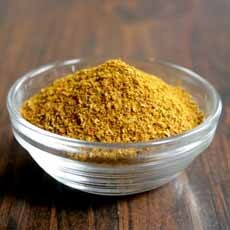 Madras curry powder. The yellow color comes from turmeric. Here’s a recipe to mix your own, from Sel et Sucre. Malaysian curry powder. Here’s a recipe from Kevin Is Cooking. 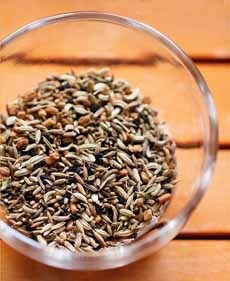 Panch phoron, Indian Five Spice. Here’s a recipe to mix your own, from Veg Recipes Of India. Do you know the difference between garam masala and chaat masala? Madras curry powder and Malaysian curry powder? We were cowed by what we didn’t know about Indian spice blends. Thanks to Raw Spice Bar for the following clarification. While every cook or company can use a different blend, or different proportions of ingredients, here’s an overview. Chaat Masala is the go-to spice blend for most Indian snacks, street foods, roasted and fried food and salads. Its tangy flavor profile comes from key notes of amchoor, asafoetida and black salt. Raw Spice Bar’s blend includes ajwain (a.k.a. ajowan caraway, carom), asafoetida (from the taproot of a perennial herb), black peppercorns, black salt, cumin, dried mint, ginger, paprika, red chiles, toasted amchoor (green mango powder) and toasted coriander. Says Raw Spice Bar: Punctuate any vegetarian dish (especially chickpeas—which are bursting with protein and fiber), or use as a topping on eggs, salads, curries or fresh fruits. Check out these recipes. A staple of North Indian cooking, garam masala is made with more than 15 spices. The blend is popularly used in chicken tikka masala, curries, dals and vegetables. Whole spices are toasted and then ground: bay leaves, black cardamom, black cumin, black peppercorns, cinnamon, cloves, coriander, cumin, fennel, fenugreek, ginger, green cardamom, nutmeg and star anise. Check out these recipes from Raw Spice Bar and Yummly. Madras curry powder and Malaysian curry powder have similar ingredients. The main differentiator is that Madras curry powder has more heat. The base is turmeric, with cassia and fenugreek for an earthy sweetness. Red Kashmiri chiles provide heat. Additional ingredients include black peppercorns, coriander seeds, cumin seeds, curry leaves, fenugreek seeds and green cardamom. Use Madras curry powder dahls, slow cooked lentils and vegetable curries. For Western fusion, add it to curried egg salad, potato salad or tuna salad. Here are recipes. 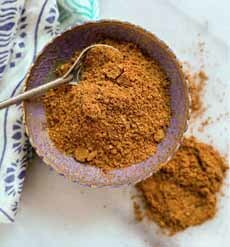 Malaysian curry powder is an earthier, milder version of a Madras curry powder, with a turmeric base. A base of turmeric includes black peppercorns, chiles, cinnamon, cloves, coriander seeds, cumin seeds, green cardamom and fennel seeds. Masala chai spices are brewed in black tea; milk is added for an aromatic, palate-seductive hot beverage. Base ingredients include black peppercorns, cinnamon, cloves, ginger, green cardamom, nutmeg, star anise, fennel & cloves. Other ingredients such as allspice can be added. In addition to chai lattes, add masala chai to cookies, muffins and puddings. Check out these recipes. Our panch phoran, which means “five spices,” contains five toasted spices: black mustard seeds, cumin seeds, fennel seeds, fenugreek and nigella. The spices are typically added to oil or ghee over medium heat, the spices toasted until they pop. The blend is perfect for tossing into—or sprinkling atop—dals, roasted potatoes or vegetables. Tandoori masala is the core flavor base of Northern India’s popular tandoori-style dishes. made with 12+ spices. The blend can be made of 12 or more spices. Raw Spice Bar’s blend includes black peppercorns, cayenne chiles, cinnamon, cloves, coriander, cumin, garlic, ginger, green cardamom, Kashmiri chiles, nutmeg, paprika and turmeric. The spice blend is Use to marinate chicken, meat, seafood or vegetables in a yogurt spice mix; the food is then cooked tandoori-style, charred over high heat. Try one of these recipes. You don’t have to make Indian recipes to use Indian spices. We live in a world of fusion food. Add the spices to cottage cheese and yogurt, dips, grains, potatoes, salads and soups. Shake them on homemade potato or vegetable chips and popcorn. Everything is yours for the spicing. Masala is an Indian term for a spice mix in certain proportions; the word derives from the Arabic masalih). A masala can be either a combination of dried (usually dry-roasted) spices, or a paste made from a mixture of spices and other ingredients (often garlic, ginger, onions, chilli paste and tomato).